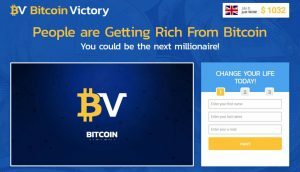 Bitcoin Victory is being marketed as an exclusive offer which will make you a millionaire virtually overnight. 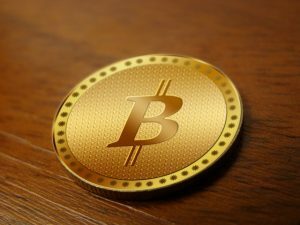 You will see the adverts and links to websites highlighting Bitcoin Victory. It’s a clever scam based on the sales pitch of making money for no effort with a computer doing the work for you. To make it more attractive it is marketed as an exclusive club to which only the privileged few will have access (that includes you of course). The ads and websites typically use fake logos from reputable businesses such as Bloomberg or top banks to give the impression of authenticity. The scammers behind Bitcoin Victory claim it is an automated trading system that deals in Bitcoins and once you have signed up it will trade your bitcoins and make you lots of money for no effort on your part. This is clearly untrue as all currency trading is high risk and there is no such thing as a sure way to win and no computer system in the world can predict what will happen on the markets. They claim it has been in testing and is now open to just a few discerning members of the public as long as they get in fast. Scams often add false restrictions – you must act now; closing shortly; almost full up etc. Your ‘investment’ is a minimum of $250 but don’t expect to make millions or ever get your money back if you try it. You may have seen adverts for Bitcoin Loophole or even read the website entries about how two guys won over the Dragons Den (BBC TV) for Bitcoin Loophole. Two best friends from university pitched their idea for an automated bitcoin trading platform, called Bitcoin Loophole. The idea was simple: allow the average person the opportunity to cash in on the bitcoin boom. Even if they have absolutely no investing or technology experience. A user would simply make an initial deposit into the platform, usually of £250 or more. The user should open a position on Bitcoin and let the trend do the work for him. Deborah Meaden deposited £250 live on the show then account management helped her opened up a position on Bitcoin so she could buy low and sell high. Before the entrepreneurs even had a chance to respond to Jones’s offer, Deborah Meaden interrupted and said with a smile on her face: “I’ve gone up to £398.42 after just 8 minutes”. Although at this point all 5 Dragons were ready to invested, a bidding war quickly emerged between Touker Suleyman and Peter Jones. Suleyman improved on Jones’ offer, by £2.5 million for 25%, whereas Jones hit back with a revised valuation of £2.5 million for 20%, effectively valuing the company at £12.5 million. Then some quotes apparently days after the show. And so it goes on for pages becoming more and more ecstatic over how much the Dragons love Bitcoin. The final pitch is to get you to sign up immediately so as to not miss the opportunity. This is a good example of fake news as the whole thing is written to look like a news item but is completely fake. The websites showing the fake news items are also fake – deigned to look like news sites and with logos stolen from reputable news organisations. Peter Jones and others have publicity denounced these fake stores and Bitcoin Loophole as a scam. Do not be taken in by fake news and scams and do not invest in anything without professional advice or at least checking for yourself that it is genuine. 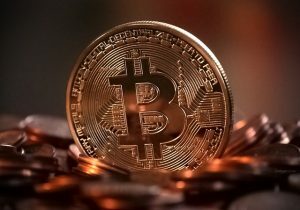 You may have seen the glossy adverts for Bitcoin Trader – the “new way to make guaranteed money really quickly”. “Cash in on the Bitcoin miracle”. Or you may have seen the news items on the Internet about how various celebrities are throwing in their lot with Bitcoin Trader. 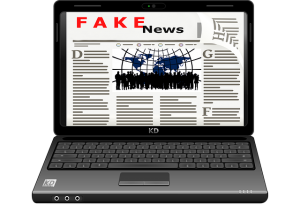 These are fake news items – invented entirely to con people into believing in this new scam, but they look like genuine news items and often carry the logos of respectable newspapers and online news agencies. One shows Gordon Ramsay saying he’s sold half of his restaurant empire so he can invest £100 million in Bitcoin Trader. Another shows Elon Musk giving up car making as Bitcoin Trader is more profitable. A very angry Martin Lewis – the consumer champion, has tried repeatedly to get the fake news items of him endorsing Bitcoin Trader removed but to no avail. Then there’s one of Richard Branson buying into Bitcoin Trader in a huge way. These celebrities do what they can to stop the criminals using their names to con people but it’s is difficult as criminals ignore lawyers and lawsuits even if you can identify who they are. The other unusual thing used by scammers to con people into buying Bitcoin Trader is the claim that its intention is to spread wealth so that the top 0.1% don’t own half of the planet’s resources any longer. The reality is just that the scammers want as much for themselves as they can get and don’t care who loses out. Ignore such fake news items and ignore anything claiming that Bitcoin Trader made them rich – only for scammers. The email says I have had 0.7 of a Bitcoin transferred to my name and I just have to click to accept the payment. The value of Bitcoins goes up and down dramatically but 0.7 Bitcoins converts to thousands of dollars. Who wouldn’t want such a windfall? To accept the transfer you click the link, which does not get you any Bitcoins but rather the website of crypto Code and a sales pitch for their software. So, it’s just speculation on the price of cryto currencies of which Bitcoin is the most famous. 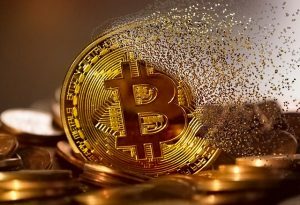 Is it possible to make lots of money speculating on Bitcoin? Yes. Many people have done so. But the price can go down just as easily as it can go up and then you lose. The email claimed I had Bitcoins transferred to me and that was untrue. The website claims you can make $15,000 in a day but the disclaimer warns you might lose everything. Not a good deal to make. For most people it’s safer to choose another investment, but if you’re going to invest in Bitcoin then do your research first and don’t respond to email offers. We’re all used to ATMs in supermarkets and shops. Some charge for getting your money and some do not. But recently, Bitcoin ATMS have started to appear in betting shops, general shops and elsewhere. These don’t give you money – instead, they let you buy Bitcoins. 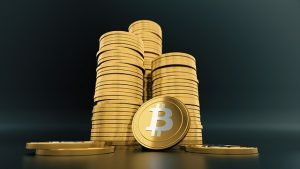 Bitcoin is a cyber currency that has been in the news a lot recently due to its rising price, thefts of Bitcoins and its use by online criminals. These new machines are used by people wanting to invest in Bitcoin cyber currency but also there is anecdotal evidence that they are used by criminals. Some shopkeepers estimate that 50% – 80% of use is by drug dealers and other criminals wanting to change large amounts of cash into something they can access elsewhere, plus the cash is effectively laundered i.e it appears legitimate. Once purchased, Bitcoins can be changed back into any currency in many places around the world. The shopkeepers where the Bitcoin machines are situated sometimes get a flat fee of £100 – £400 per month and sometimes they can get up to to 30% commission. This shows that the charges the buyer has to pay to the machines must be very high to allow for such commission to be paid to the shopkeeper. The machines generally have a limit of about £500 per transaction, but no limit on the number of transactions per person. For criminals, these machines are ideal repositories for their ill-gotten gains. 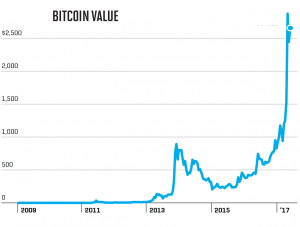 The price of Bitcoins rose rapidly throughout much of 2017 but it is very volatile and could easily crash at any time and become almost worthless.